2. What is a magnetic field reversal? a. the Earth's magnetic poles may have moved. b. the Earth's magnetic poles have switched alignment many times in the past. d. the continents have moved over time. Questions 4-11 apply to the Structure of the Earth Diagram below. Note: layers on left are classified by chemical properties, layers on right are physical properties. 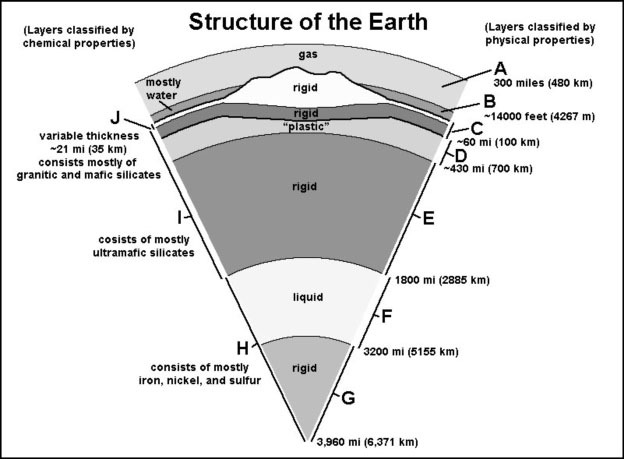 Match letters (A to J) to features on the Structure of the Earth diagram. 4. Which letter is the Asthenosphere? 5. Which letter is the Atmosphere? 6. Which letter is the Inner Core? 7. Which letter is the Crust? 8. Which letter is the Lithosphere? 9. Which letter is the Mantle? 10. Which letter is the Mesosphere? 11. Which letter is the Outer Core? 14. Which of the follow statements is NOT true? a. An earthquake fault is an active fault that has a history of producing earthquakes. b. Not all faults are active or are considered earthquake faults. c. All faults are actively capable of producing earthquakes. d. Active earthquake faults can produce both earthquakes and creep. a. the distance from an earthquake focus. b. the magnitude of an earthquake. c. the intensity of an earthquake. d. All choices are correct. 18. What can seismic (P and S) waves data tell us? a. Parts of the earth are not solid. b. The depth, location, and relative strength of an earthquake. c.	The average density of each layer in the Earth. a. the boundary between granitic continental crust and basaltic oceanic crust. b. the boundary surface between the earth's crust and the mantle, lying at a depth of about 6–7 miles (10–12 km) under the ocean bed and about 24–30 miles (40–50 km) under the continents. c. the boundary between earth’s rigid mantle and the liquid core. d. a fault boundary between two plates in a subduction zone. a. denser than ocean crust. b. is mostly basalt in composition compared with ocean crust. c. contains more granitic rocks than ocean crust. 21. This extensive region that surrounds the Pacific Ocean basin is both a major earthquake zone and volcano zone. 22. The theory of continental drift (proposed by Alfred Wegener in 1912) was supported by what kind of evidence? a. the coastlines of continents on a world map. b. evidence of sea-floor spreading. c. identical fossils and rocks found on two separate continents. d. changes in climatic patterns. a. about 2 million years. b. about 20 million years. c. about 200 million years. d. about 2 billion years.